Van rentals, convertibles, luxury cars, SUVs and sports cars are some of the most popular & highly rented categories in the Miami. Rent a car for Miami in just three quick steps - search, compare, reserve! Cancel your Miami car rental for free, up to 48 hours before the pickup time. Rent a Car in Miami with USA Cars Rental & Save Big! Book a car rental in advance and make your trip to Miami easy and comfortable. Via our easy-to-use online booking engine, we provide you with a wide selection of cars from trusted suppliers. Accessible under different segments, the cars can instantly be hired by paying in any currency you own. Travelers are advised to rent their cars in Miami at least 3 months in advance to avoid any last minute booking hassles. We have alliance with the top car rental brands that you can trust. We take pride in our wide network of car rental suppliers that are inclusive of both local and global brands. As similar car models are offered from different suppliers, you can always compare deals to find the most affordable one. These suppliers keep a regular check on vehicle performance & different car rental schemes are offered like, one-way, two-way and long-term rentals, so you can zero-in on the most convenient deals meeting your budgetary specifics. SIXT, Thrift, Dollar, Alamo, Hertz, ACE, etc are amongst the top suppliers we deal with. How Renting a Car for Miami is Beneficial? The cleanest city of America is known to the World for its beaches. The many tourist attractions such as museums and gardens make it a favorite amongst enthusiastic travelers, thus earning the status of Alpha World City. With so much to see and do, a car rental is definitely the best way to travel in the luxury and comfort that you deserve. When renting a car for Miami, you can search across our wide inventory to book any of the cars such as luxury, compact, economy, SUV’s, convertibles, etc amongst others. The booking process is really easy! Car Rental for Miami – What Deals Include? The convenience to pick-up and drop-off the car at any desired location; one-way service is offered for a fee. We strive for utmost client satisfaction, thus, the rental cars are available at cheapest-possible prices before the time of pick-up. Book a car rental for Miami online with us in advance to your arrival here and make the most of our affordable services. Hop on to your Miami car rental and explore the best of this astonishing holiday destination. The vastness of one of the most visited city in World will amaze you to an extent that a visit once will not be enough to experience the best of this region. At USA Cars Rental, you can book your rental car online in just 3 simple steps. Our online booking engine is very easy to use and we also provide 24×7 booking support. Simply select your preferred pickup location from the list and book a car rental package of your choice in Miami. Alternatively, you can also contact our booking support team in case you find any issues. Whether you are visiting on a holiday with your family or for business purposes, we will accommodate you with the most suitable Miami car rental services. With no hidden charges included, we provide an array of extra benefits with all hired cars. Planning your next trip to Miami with us will also entitle you to get various seasonal discounts on all car rental deals and packages. Plan your trip to Miami with us and book your rental car in advance! Visiting Miami- The City Highlights! As is the case with every vacation spot, there is something for everyone in Miami. However, in case of Miami, there are many different enticements for every single person. Right from the hustle and bustle of Calle Ocho to the thrilling energy of Little Havana, the exciting nightlife of South Beach to the plush hotels of Miami Beach and historic hideaways of Coral Gables; the city promises seemingly endless opportunities for indulgence. If there are family-owned shops for quaint shoppers then there even exist modern-day malls in the other corners of the region. For those looking forward to a comparatively longer vacation in Miami, the activities such as gold, tennis and deep-sea fishing are the ideal fit. For epic indulgence, visitors can be part of boat shows, art festivals, auto racing and wine extravaganzas amongst other notable things to do. Life in Miami includes all of it and beyond. Thus, make it a point to rent a car for Miami well in advance so that the every nook and corner around can be comfortably spanned. Biscayne Bay to the east and Florida Everglades to the West- Miami extends over a large area to be the tourist hot spot that it is known to be. There are many interesting things to do here to keep one busy. Everglades National Park: Want to admire alligators up close, visit Everglades that is home to over 2000 alligators and similar such species from around the World. It is ranked as the largest subtropical wild habitat in the country. Rare species of other endangered species can also be seen here. Those interested can also travel to the Ancient Spanish Monastery that was built in Spain. If accompanied by family, you can travel to Zoo Miami or even to Miami Seaquarium. The Arcade Odyssey can also be visited to enjoy arcade games, pinball games, etc. Other arcades can also be visited here. If you have pre-booked car rental for Miami then it is well worth the time to visit Miami Beach and Biscayne National Park. At the beach side, you can take part in many interesting activities. The dining culture here is also equally impressive as people of different tastes can find exotic cuisines of different flavors and cultures. Joe’s Crabs is the traditional favorite here. Not only in terms of business and finance; rather Miami also houses several parks, entertainment venues, theatres, museums and performing arts centers. Some of the popular museums in Miami include History Miami, Miami Children’s Museums, Frost Art Museum, Miami Art Museum, Miami Science Museum and Vizcaya Museum and Gardens. Miami also houses the largest art exhibition in the world, known as Art Basel Miami (Olympics of Art). Thousands of people fly into Miami every year for taking part in this art fest. Numerous popular restaurants chains have Miami as their birth place, such as Burger King, Benihana and Tony Roma’s. Discover awe- inspiring pristine beaches and various natural wonders in Miami with budget car rental deals. Located in South- eastern Florida, Miami is a city on the Atlantic coast. Miami is a part of Florida’s largest and most progressive metropolitan area. Due to Miami’s reputation as the major center of arts, media, entertainment, finance, international trade and commerce, this American city is also classified as an Alpha- World City. The quality of life in Miami also brought this city the title of “America’s Cleanest City”. The various recycling programs and preservation drives have kept Miami clean and beautiful over these years. Famous among all travelers visiting Miami is also the Miami Beach. Miami Beach is a completely different municipality in Miami and is situated on a barrier island towards the east of Biscayne Bay and Miami. This place houses numerous budget and luxury beach resorts. All this makes Miami Beach one of the preferred destinations for spring beach parties across the globe. We provide pocket- friendly car rental packages inclusive of various extra benefits and offers. Minimum Age to Rent a Car in Miami: The minimum age to rent a car in Miami varies from supplier to supplier, therefore, have a look at the car rental terms and conditions for the current information. Generally speaking, 21 is the minimum age eligibility condition and all the renters below the age of 25 pay a small ‘young driver’ surcharge. Provide your correct age at the time of car rental booking, supplier refuses the rented vehicle if found underage at the time of pick up. What Documents Do I Need to Rent a Car in Miami? : A valid driver’s license (DL), a credit card, and an Identification proof, preferably your passport. You will need your international driver’s permit or the official translation of your driver’s license if your DL is not in English. Can I rent a car in Miami without a credit card? : A credit card is one of the major documents that you need to rent a car in Miami. If you don’t have a credit card, you can use one of your relative accompanying you, if not, give us a call and we will help you arrange car from the supplier which allows debit card. If you are using someone else’s credit card, note that the booking will be made in the credit card holder’s name and if you plan to drive, you can get yourself added as the additional driver. Can I rent a car in Miami and return it in Key west/Orlando: Yes; as already stated before, the one-way service is offered for a small per day fee. Miami Beach: – Beautiful Island connected to mainland of Miami. Art Deco District: – Ancient Florida with restored buildings of 1930s. South Beach: – The most popular section of Miami Beach. Bayside Marketplace: – Unique outdoor mall with numerous activities. Vizcaya Museum and Gardens: – Treasure of art, architecture and culture in Miami. Bombay Durbar: Exotic Indian cuisines served in typical Indian style. 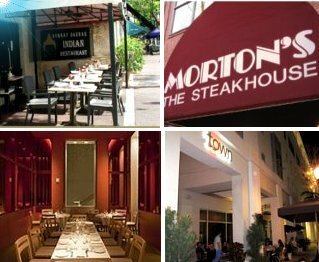 Morton’s The Steakhouse: The perfect place for grabbing a powerful lunch. Db Bistro Moderne: Offers elegant private dining and catering services. Town Kitchen & Bar: One of the best restaurants located in South Miami. This Bar has been known for its popular, and tasty, American cuisine.